Last week the Azure Key Vault went into preview. The Azure Key Vault is a service for securely saving passwords and certificate for use in your applications. 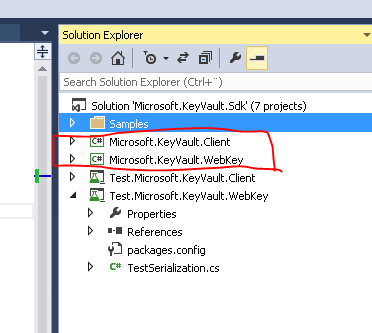 By using Azure Key Vault, you can avoid having e.g. username and passwords written directly in your configuration files, that way you can ensure that this type of information is not available to developers but only to people in operation. Azure Key Vault will also some time in future provide an audit log, so you can monitor who is accessing it. With Azure Key Vault also possible to gain access to Hardware security modules (HSM), but if you want to play around with that you will pay around 50 cent per key, whereas the software keys/secrets are billed per 10000 REST operation you perform against the service. Enough chit chat, lets see how we secure a password we indend to use in a Azure Web Job. I have choosen this example as it will lead us through many of the principles of the Key Vault, and I feel that web jobs are particular prone to bad security habits – after all they are just console applications :). For the moment there’s no GUI to mange the Key Vault in any of the Azure portals, so you are stuck with the REST API or the PowerShell commandlets. 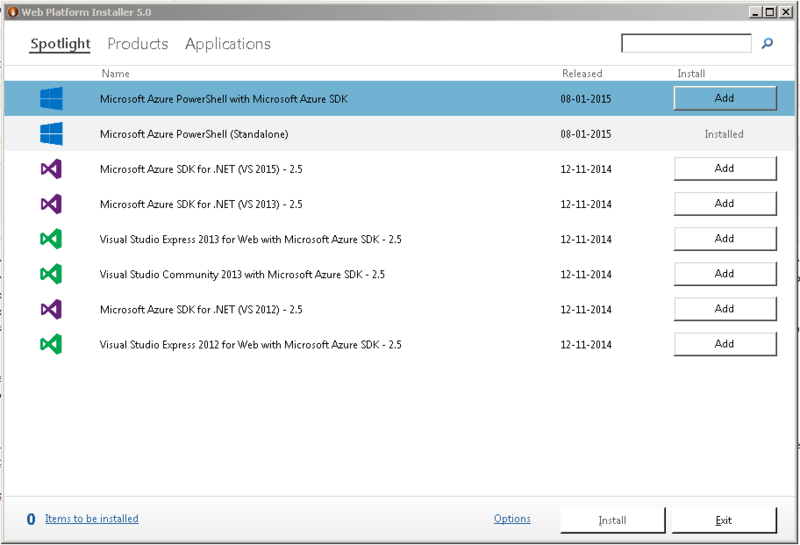 I went with PowerShell, so first step is to make sure you are on Azure PowerShell released on January the 8th 2015, you can check this in the Web Platform installer. After that you need to download the Azure Key Vault commandlets, you can grab them from here http://go.microsoft.com/fwlink/?linkid=521539, be sure to unblock the file. Now you are ready to create you Key Vault. You can have several key vaults in your subscription, a key vault act as a container that can hold multiple certificates/keys or secrets. If you are using resource groups it would probably make sense with a Key Vault per resource group, especially since there’s no cost associated with having the vault. If you specify a none existing resource group it will be created. In case you are not logged in, you might have to run Add-AzureAccount. You will see that the object that have been granted full control to the key vault is my user, so that should be okay. We will get back to granting permissions to the Key Vault in a later section. So now we have a key vault, but we need to add something highly valuable to it (right Sony :)). The vault can contain either keys or secrets. Keys are certificates and secrets can be any small piece of information that you want to keep secure, most likely passwords or AccessTokens to e.g. other Azure Services like storage accounts. 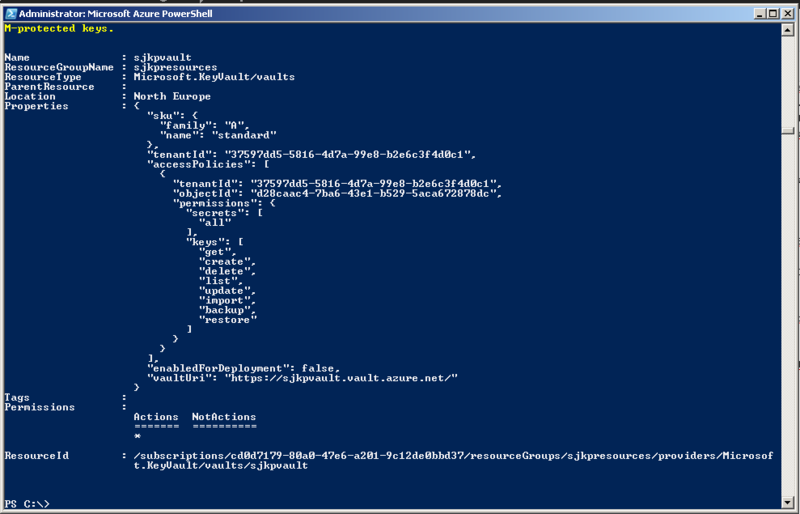 For our purpose we want to store a password, we do that by the following two powershell commands. The second command will return a few things, the most important here is the Id (https://sjkpvault.vault.azure.net/secrets/MyPassword/94fd5e8fe2eb447abc6be515e1e9d08c) which really is an REST endpoint where the current version of MyPassword is stored. The version of my password is indicated by the guid. Okay, so far all we have done is to store a password somewhere in the cloud. Without being able to access it in a secure way from the Web Job it is pretty much useless. Luckily the Azure Key Vault Team, wrote a client library for working with the Key Vault REST endpoints that we can use to obtain the password from the Vault in our Web Job. The library can be downloaded here http://www.microsoft.com/en-us/download/details.aspx?id=45343. I would assume that it sometime in the near feature will be turned into a Nuget package, but so far I haven’t been able to find it. So you have to download the zip and extract it and pull the following two projects out. I did have some trouble building the projects because of some Nuget targets in the csproj files, but I just removed that and then it worked for me. The client library supports two methods for getting a key or a secret for a Vault. Both methods involve an Azure AD application. The reason why an Azure AD application is needed is that we configure the permission on our Key Vault to some object in Azure AD (either user or application). Then our Azure Web Job (or any other program), obtains an access token from the Azure AD application that we can pass along with our requests to the Key Vault, which then knows that we are infact who we claim to be, and thus will give us access. I feel that the second approach is better, because it is common to keep the certificates out of reach for application developers. I will explain how to use that approach (it’s also slightly more complicated). First we need to generate a certificate (or obtain one somehow). You can use openssl as explained in my other blog posts here. Or just use the commands provided in the readme for the client library. Each line is a separate command. Once we have a certificate it is time to register an Azure AD Application, we must turn to Powershell when we are taking the certificate route, if you were doing the secret you could do it from the portal, in that case you have to fill out the redirectUrls with dummy data. Before we try to create the Azure AD App, we should run Connect-AzureAD to select the Azure AD you want to create the App in. I stored my certificate in C:\openssl. Here we specifically grant only the get access to our Azure AD App. If you were using the Secret method instead and you created the AD App from the portal, then the $adapp.appId should be replaced with the ClientId as listed in the portal. Now we are finally at where we want to be. Everything is setup, and we are ready to consume the password from our Azure Web Job. I created a project that I placed on github, that shows all the details, most of the code is copied form the samples provided by the Azure Key Vault team. My Azure Web Job program looks like this, it’s installed as an ondemand webjob and as you can see it does nothing except loggin that we are able to obtain the password. //TODO the secret URL should go into appsettings too. It uses a few helper classes, firstly the CertificateHelper that enables us to get the certificate from the Azure Website. // Don't validate certs, since the test root isn't installed. In order to access a certificate from an azure website/azure web job, it must first be uploaded to the Configure tab in the portal, and then a reference to the certificate thumbprint must added under appsetting, otherwise the certificate won’t be loaded into the CurrentUser store. Secondly I have reused the KeyVaultAccessor from the sample code, that helps me authenticate and get the secret from the KeyVault. /// This class uses Microsoft.KeyVault.Client library to call into Key Vault and retrieve a secret. /// Authentication when calling Key Vault is done through the configured X509 ceritifcate. In my app.config I have added the following two app settings that links together our certificate with our Azure AD application. As we can see the jobs logs my password: MySecretSauce so everything is to be working! Your right, I think I used VS2015 and for some reason the Enable NuGet Package Restore option is no longer there. Add-AzureADApplicationCredential when trying to load the cert for the azure Ad app is returning an unrecognized error …do I need to install an active directory module or something for powershell? If you’re able to write the value of the secret to the log in plaintext, doesn’t that mean a disgruntled employee would need only write out all secrets to the console and copy them down? Or am I missing something here? Yes you are right. But that would always be the case with passwords that are just encrypted and not hashed (and hashed password really wouldn’t work for auth purposes). The point of the keyvault service imo, is that you can see (audit log) who accesses the vault, and you can have a very fine masked settings on who (apps or users) can access which secrets. But generally if you don’t trust your admins and you don’t do code reviews to catch the disgruntedled developers putting in backdoors, then you are in for a very hard time.